Visa price: $50.00 + $35.00 processing fee. Reserved for American Airlines passengers only. Visas cannot be shipped outside the continental U.S. 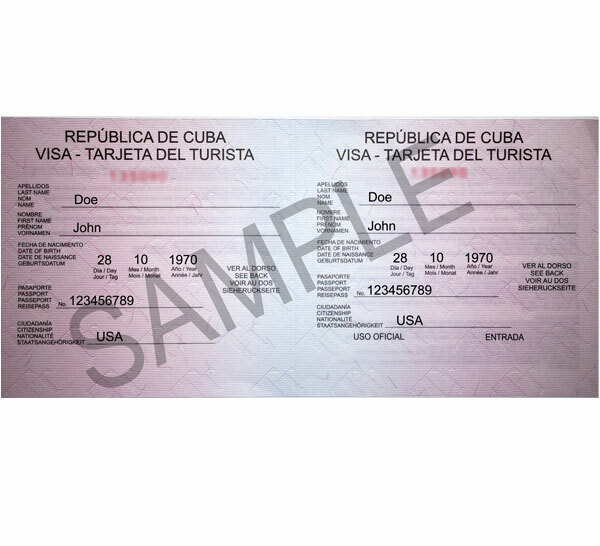 TOURIST CARDS ARE NOT VALID FOR INDIVIDUALS BORN IN CUBA. FOR THOSE INDIVIDUALS BORN IN CUBA THE VISA ENTRY PROCESS IS DIFFERENT AND YOU MAY CONTACT US DIRECT AT 562-264-5135 FOR FURTHER INFORMATION ON THE PROCESS. Please note: the above pricing is for advanced on line purchased visas for AA travelers only who wish the visa to be sent direct in advance of travel.